Cedar siding is very durable against the elements but still requires regular maintenance and depending on the climate should be restained every few years. Any exposed wood is susceptible to the elements that cause mildew, swelling, splitting and cracking. The most damaging element to cedar siding is moisture. Regular inspection and minor repairs to prevent moisture damage help prolong the finish. Siding requires restaining and regular maintenance. Cedar siding endures well against the elements, moisture, rot and invasive insects. Cedar has natural preservatives making it resistant to damage caused by moisture, heat and severe weather with only negligible cracking or splitting. Regular inspection of the cedar siding is essential to maintenance and knowing when to restain. Walk the exterior looking for obvious damage, rotting, splitting, bubbling or chipping of the finish. Spraying the cedar siding with water will make problem areas easier to see. Inspect all caulking and repair or replace any that is damaged, cracking, peeling or missing. Inspect the flashing (the seal between the roof and chimney) for signs of water leakage or damage. Look for any signs of mold. Clean mold off the siding by pressure washing with a mixture of detergent with a small amount of bleach. Rinse the soap and bleach with water. Depending on the annual local weather conditions and how much damage it does to the cedar siding, expect to restain every three to five years. There will be no difficulty in determining when it is time to do the job. 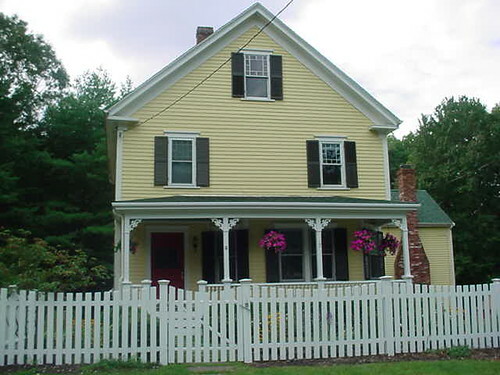 How well the siding has weathered the elements determines how often to restain. Pressure washing the stained siding will prepare the surface. Pressure washing is not recommended for painted siding because it will remove paint unevenly. Traditional painting preparation methods of scraping and sanding work well for cedar siding. The stain should be matched to the needs of the siding. If the house is exposed to excessive sunlight, heat and ultraviolet light, choose a durable stain that won't fade. If dampness, rain or snow is a concern, choose a stain that will seal well and be resistant to moisture. Most importantly pick the highest quality stain even if it costs more. This is the protection for the siding and how well it holds up determines how often restaining is necessary. Woodpeckers are attracted to insects and can cause a lot of damage to cedar siding. It is important to keep the siding as bug free as possible. Hang wind chimes or a simple handmade facsimile from the porch awning to deter woodpeckers. If woodpeckers are a real problem, try hanging a wire basket and place a piece of suet inside. Suet is hard fat from a sheep or cow. This will interest woodpeckers far more than the insects on the cedar siding.